Long exposure photography of the night sky. 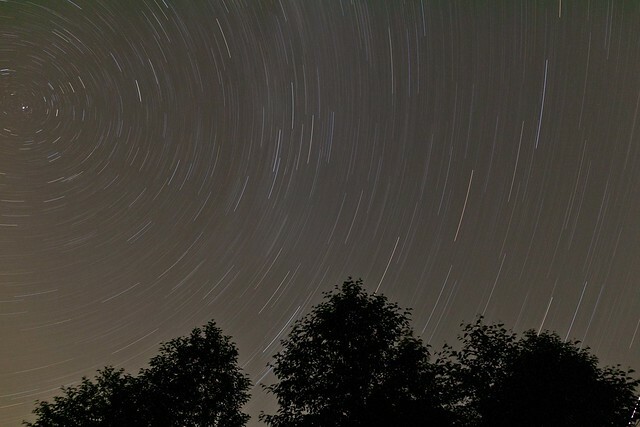 This was my first try at doing a long exposure on a digital camera of the night sky. An external timer was used to keep the shutter open for 45 minutes. Even after touch up post processing, the image is very, very noisy. The noise floor on most sensors has quite a bit to do with how warm they get. Folks go to extremes to get their sensors cold, the most typical solution is to use a TEC/Peltier junction. One issue with these chillers is that they only push heat to the other side of the plate - - you still need to get it out of the system somehow; this is typically done with large heatsinks and fans. I found a company which will modify your stock DSLR to have a chiller, but it's a very expensive prospect, on the order of 3 grand. I think I may try modifying a cheap point and shoot camera first to see what sort of results I can get... if I can find one which will let me take long exposures. For now, I'm going to make sure I get my camera to take a black reference first (doh*), but this effectively doubles the time it takes to do a shot, as the exposure time has to be the same for the black reference. This was shot on a 5d mark II, using a 24mm f1.4 prime lens. I'm happy with the result, but I crave less noise. While I have a love/hate relationships with social networks, I do tend to try and keep up to date in that world by using whatever myspace clone is all of the rage. This year it turned out to be called google plus. All social networks all have this concept of identity and trust to manage. Reputation, trust and security are important to users; if they get spammed or hacked, they will leave. At the same time, you can't truly authenticate a user without showing up at their house to look at their photo ID. Combine that with XSS, sql injection and homograph identity spoofing - - and you've got a "tricky to meet" set of requirements. These are hard problems. At the same time, they are hard problems they decided they wanted to solve. Sadly, my name falls into this strange edge case of "looking funny" while also being my legal name: A judge signed my name change. That's a bit stronger of a ruling than any community guidelines posted on a dot com. So I've been working with google over the past 2 weeks regarding my google plus account. Moments after I signed up (using my legal name of 3ric Johanson), I was informed that my account was suspended for violation of community standards. The really good news is that google has an appeal process - provide more information to them, and "We try to complete reviews within one business day." This is the first social network which seemly provides a clear path for managing this problem. Go google, maybe that's how you earned your plus. There's an amusing back story in here how my name is hard coded into the core facebook application, but I'll leave that story for another day. I have sent all of the information google has requested 3 times now. I had a kind director at google also inform them it's really my name. At this point they have not responded to a single message in a week. While I understand they may not agree with the judge who signed my name change, it is in fact my legal name. For anyone with root@google, feel free to see the thread on ticket number 83274326. My hope was that google would provide a level of professionalism which includes responding to their own defined appeal process. Sadly, they have left me disappointed. While I could try phishing around for more contacts at google, my interest in further supporting their project has sadly diminished. Dearest google, if you'd like me to play in your sandbox, you'll have to come to me. Finally, if you are really unsure of my name, please just google me. while we reviewed your profile name. we will be launching profiles for businesses and other entities later this year. services that require an active profile, such as Google+, Buzz, Reader and Picasa. This will not prevent you from using other Google services, like Gmail. * Sent google a link to this blog entry. * zero response from google support department. * Sent google a link to this blog entry via the "submit additional information" process, again. * backed up all of my data from google. Lots of ethernet switches!!! Used for things like gaming parties, so 50 of your closest friends can come over and play WoW. Or Quake. Maybe some StarCraft. You know, bring your tower and CRT. Perhaps your basement gold mining operation. Also for dorms, boarding houses, sweatshops, 419 scams, and other places where a multitude of unwashed masses are kept. Which is different than your aforementioned LAN party. Can buy as a set (if you have lots of friends) or as individual units (if you.. well.. don't). Contact HBL.stuff@gmail if you're interested! 12 x HP ProCurve Switch 4000M boxes each w/ one switch engine module with varying number of 10/100 ethernet modules and gigabit fiber modules.